Neil Patrick Harris is one of my favorite actors, and human beings, so I was exstatic when I first heard he had an autobiography coming out. Even more so when I found out he had created the unforgettable, witty, and heartfelt one I devoured, the first time*, while spending a night in the ER waiting room. Going into the first reading I expected NPH to fill the book with tongue in cheek humor, and spend a good portion of it rehashing his many adventures in film, tv, and stage. I didn't, however, expect the brutally honest - NPH style - 'chapters' about his struggles with self acceptance, or the way he spoke of his children, David, and his parents caused me to smile even when there was a suspicious wetness leaking out of my eyes. 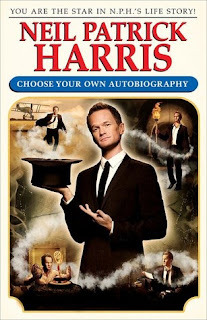 I loved the nostalgic take on format NPH chose, and the way he wrote the book in second person POV, as though you were truly working your way through one of the classic Choose Your Own Adventure novels. It really brought me into the story, and gave me the opportunity to follow NPH through his life, focusing on what I wanted to know the most about, each time giving me a brand new experience. Choose Your Own Autobiography is a book I have, and will, reread multiple times. Not only because of its utterly unique format, and my sheer fanigrlish love for him, but also because I can't seem to get enough of NPH's fantastic writing. -Physical copy provided by Blogging For Books, in exchange for a review. *you can't just read it once, you've got to read it again and again to get the full NPH experience. And you want the full NPH experience, don't you?